Criteria used to identify Fe2+ - Fe3+ and Fe2+ - Ti4+ intervalence charge transfer absorption bands in electronic spectra are reviewed and compared to the characteristics of unperturbed Fe2+ crystal field bands and those that are intensified by interaction with Fe3+. Band energy is the least definitive diagnostic criterion. Changes in band intensity with temperature are also of limited value. Large widths are the most reliable characteristics of charge transfer bands. 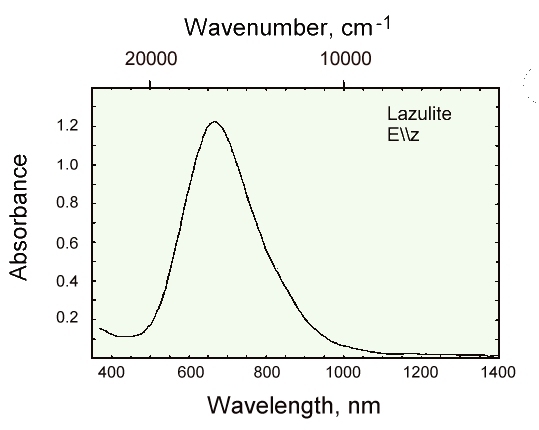 New optical absorption spectra are presented for euclase, as well as 80 K spectra of rockbridgeite, babingtonite and lazulite. Comparison of optical spectra to magnetic susceptibility measurements for rockbridgeite and babingtonite provides support for recent theories regarding the effect of magnetic coupling on the variation of charge transfer intensity with temperature. Polarized spectrum of lazulite at 296 K showing the Fe2+ - Fe3+ intervalence charge transfer absorption at about 660 nm.